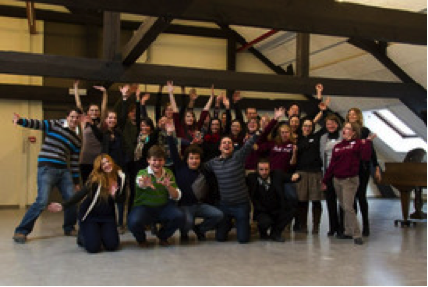 In February 2013 we held the 11th EAS Student Forum (SF) at the Lemmensinstitute, B. The focus of the forum was “Reflective Practice in Music Education”. The SF provided an opportunity for 24 students from 12 European countries (Austria, Belgium, Czech Republic, Croatia, Cyprus, Germany, Latvia, Lithuania, the Netherlands, Poland, Slovakia, Switzerland). 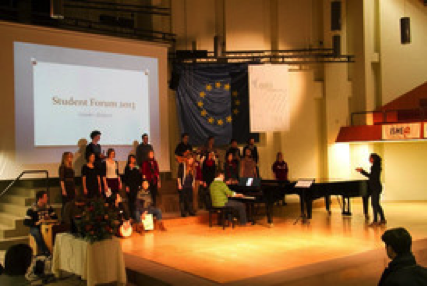 The SF opened on Monday afternoon, 11th of February, with a short welcome concert given by the students from Lemmensinstitute. This was followed by an outline of the SF concept and working plan, short introductory presentations by participants, and a number of familiarisation games to settle the atmosphere and unite the group. Using a combination of working in different subgroups and plenary meetings, Day 2 was dedicated to sharing musical activities and materials. Posters prepared by the students focused on their teaching training programmes and teaching practice. Some students brought video examples from their music lessons or examples of lessons from their countries.The third day focused on improvisation and creativity in music. It included a workshop led by Professor Tom Mahieu (Lemmensinstitute), Marina Gall’s session on the main theme Reflective Practice in Music Education and group work on preparing for a performance to delegates at the opening ceremony of the EAS congress. The final day started with the morning rehearsal and presentation at the EAS conference. This was well received by the audience and students felt that they got approval for their work. The SF closed with an opportunity for participants to reflect on the activities and outcomes of the SF and the impact of the whole process on them.